California Gov. 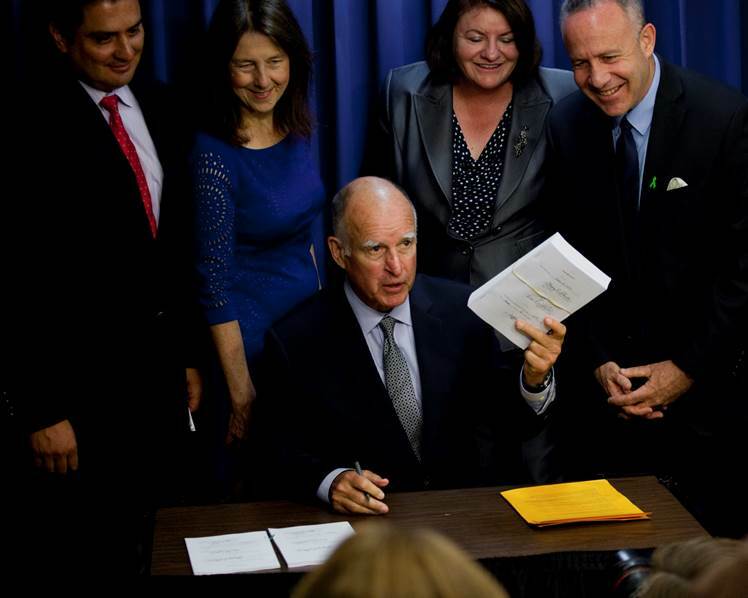 Jerry Brown was in San Diego last Friday – June 20th – for a budget signing ceremony. While much of the press coverage focused on all the backslapping and self congratulating about fiscal responsibility, a low-key rider attached to the budget bill by Assembly Speaker Toni Atkins is a big victory for beach lovers. The California’s Coastal Commission is now allowed to levy fines on property owners who deny public access to he Pacific shoreline. Since 2008, when the Legislative Analysts Office recommended the notion, the legislature has tried and failed three times since then to pass a bill giving the commission a better enforcement mechanism. Under current law, the agency that for four decades has overseen land use and public access along California’s 1,100-mile coastline must go to court to collect penalties from those who harm coastal habitat, build without permission or block public access to the beach in violation of the California Coastal Act. The process is time-consuming and expensive, enabling many violators to continue breaking the law for years. The commission has long sought the ability to issue fines to start clearing its backlog of more than 1,900 enforcement cases, but it has repeatedly faced opposition from business groups and agricultural interests that say the agency already wields too much power. All this hubbub would be unnecessary, but for the fact that certain wealthy homeowners have made a habit of flipping the Coastal Commission the finger when it came to granting public access to the shoreline. It’s really an issue about some people being “more equal” than others. In Malibu they use fake “No Parking” signs to keep surfers off “their” beach. In La Jolla it took over a decade to get a judge to order the re-opening of beach access after a homeowner arbitrarily closed off a path used by the public since 1932. In San Mateo County a Silicon Valley billionaire is fighting in court to close public access to Martins Beach. Fines assessed by the Coastal Commission will still be subject to administrative hearings and court review. But property rights advocates have cried foul, and said the new law puts an unfair burden on property owners. It’s “a significant game-changer,” said Damien Schiff, an attorney at the Pacific Legal Foundation. “A lot of property owners would say the potential downside risk — the value of the penalties and the costs of litigating — could be so high that, even if that property owner was 100 percent certain he’s right on the law, it wouldn’t be worth it to him,” he told the Bay Area News Group newspapers in San Francisco. The is an excerpt of Doug Porter’s daily column at San Diego Free Press, our online media partner. Like the City of San Diego, blocking access by taking parking spaces to place a trailer.